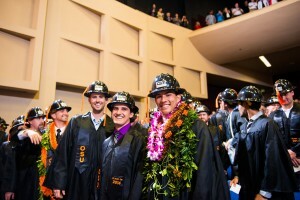 The OSU School of Civil and Construction Engineering handed out 181 undergraduate and 46 graduate degrees during the 2013-14 academic year as the class was honored at the annual CCE Graduation Ceremony on Friday, June 13, at the LaSells Stewart Center on the OSU campus. The event, separate from OSU Commencement, was an opportunity to recognize the hard work and positive impact the group had on the school during their time at OSU. Many graduates will immediately enter the workforce (construction engineering majors have a near 100-percent job placement this year) while others are continuing on to graduate school in their discipline of choice. As part of the ceremony, Patrick Burns (civil engineering) and Jason Powell (construction engineering management) were honored as they received the OSU CCE Student of the Year Awards. Photos from the event, attended by over 1000 people, can be seen on the school’s new Flickr Photostream.